In cosmetic dental bonding, an enamel-like material is applied, hardened and sculpted to close spaces between teeth, cover flaws, or improve the color or shape of teeth. Composite tooth bonding is a cosmetic dentistry technique that can work wonders for your smile. Using materials that match the shade, translucency and texture of your teeth, gaps between the teeth can be closed, spots, chips, and discolorations can be eliminated, and your self-confidence can be enhanced through the improved appearance of your smile. How is a tooth bonded? Tooth bonding is usually a one-visit procedure. The tooth is prepared by lightly roughening the area to be repaired, which usually doesn’t require anesthetic. The surface of the tooth is then etched with a gel, and a treatment of bonding primers and resins is applied to the tooth. Dental composites are made to a paste-like consistency so that they can be sculpted to the proper shape and applied. They contain various pigments that are matched to your tooth color, and they come in varying degrees of translucency. This composite is applied to your tooth, sometimes in several layers in order to duplicate the depth of color that occurs in a natural tooth. A high-intensity curing light is then used to harden it. With the latest dental technology, we can mimic the color details and translucency of your tooth for a natural, healthy appearance. How long will tooth bonding last? The technology of composite tooth bonding materials is wonderful as far as the beauty that it can bring to your teeth. There are some limitations to the materials of which you need to be aware. How long bonding lasts depends on many factors that are unique to the individual. Many people will go for ten or fifteen years and have the bonding look as good as the day it was put in. Some people will get staining on the margins of the bonding after one or two years and will need some touch-up work. If you take care of it well, bonding may last up to 15 years, but some touch-up work would be normal after three to five years. Under normal mouth conditions and if used as recommended, the tooth bonding work will not darken or discolor with age. 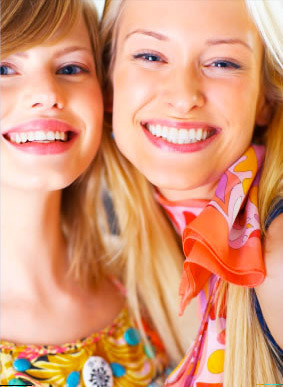 If improper professional cleaning does not damage the bonding, it should not stain any more than your natural teeth. In most cases, it is also durable enough to withstand the stresses of ordinary mouth function. © 2019 Ragozine Dental Care, Girard, Oh. All Rights Reserved.